Third time using Core Support for my detox. First time was brutal. Headache, nausea and no energy but I made it thru and felt great. Second time not so bad still had the caffeine headache but after day one I was great. Third time, OMG amazing results. Only time I felt sluggish or yucky was after 7p. This time I lost 10 pounds and my body feels like it is a fat burning, easily digestable vessel. I was on an antidepressant for years plus other prescriptions. I believe my body stored a lot of those dogs in my liver bc my body was not metabolizing the drugs correctly. I think the first time I did Core my experience was bad bc I was literally going thru withdrawal from old drugs store in my liver. It has been almost two years completely drug free and now my body can finally handle this detox. People this is the real deal and it works, yes it took me three rounds to feel the amazing detox experience but it was worth it. I now take two scoops in the morning every third day just to keep my body toxin free. Life changer!!! Mix 2 scoops (40.18g) of Core Support with 8 oz. of water or the beverage of your choice 2 times daily. Core Support was created as part of the Core Restore kit. Core Restore supports Phase II liver detoxification by providing protein, fiber and nutrients to help eliminate toxins from the body. The human body is exposed to a wide variety of toxins on a daily basis, including chemicals found in foods, environmental toxins and pharmaceuticals. The liver is the body’s main detoxification organ which provides enzyme systems that safely process and remove xenobiotics (foreign chemical substances) out of the body, as well as unhealthy hormone metabolites. These detoxification systems are very complex and require a variety of nutrients for optimal function. There are two main pathways of detoxification in the liver, known as Phase I and Phase II. In Phase I, composed mainly of cytochrome P450 enzymes, non-reactive compounds undergo specific reactions which use oxygen to form a reactive site on the compound. Most pharmaceuticals are metabolized through Phase I biotransformation. This prepares the metabolite for the next step of detoxification knows as Phase II. Phase II is a crucial step- if molecules from Phase I are not fully metabolized by Phase II conjugation, they may cause free radical damage to proteins, RNA and DNA within the cell. Phase II reactions result in the biotransformation of fat-soluble compounds into water-soluble compounds that can then be excreted in the urine, bile or stool. The ingredients included in Core Support were chosen for their ability to support one of the six pathways of Phase II detoxification. N-acetyl cysteine, along with glycine and taurine, is a well-known amino acid that plays a role in supporting the liver. Antioxidants such as lipoic acid, green tea, ellagic acid and the vegetable antioxidant blend provide a synergistic approach to liver support and promote enhanced detoxification. N-acetyl cysteine (NAC) is a sulfhydryl-containing amino acid that is commonly used to support liver health. Though studies have shown the absorption of oral glutathione to be limited, supplementation with NAC has been shown to significantly increase circulating levels of glutathione, a primary antioxidant that protects cellular health. [1-3] Increasing glutathione levels increases the production of specialized antioxidant enzymes, such as glutathione peroxidase, glutathione reductase and detoxification enzymes such as glutathione S-transferase. Through the activity of these enzymes, NAC protects the body from oxidative damage, increases Phase II detoxification, and enhances the normal breakdown of toxins and other metabolic by-products of the body. One of the six Phase II detoxification pathways is amino acid conjugation (the attachment of amino acids to a toxin). Glycine is one of the amino acids used in this process. Glycine also aids in glutathione conjugation. Glycine preserves intracellular glutathione concentration and protects cells from oxidative damage. This process is mediated by a protein called glycine transporter 1, or GLYT1. Research has shown that glycine treatment of human intestinal cells against an oxidative agent, reduced the intracellular concentration of reactive oxygen species (ROS) when exposed to oxidative challenge. Lipoic acid is a potent antioxidant that has been shown to increase glutathione, vitamin E and vitamin C levels in the body. Lipoic acid has been shown to support Phase II detoxification by increasing the activity of enzymes including NAD(P)H, quinine oxidoreductase, and glutathione-Stransferase. Lipoic acid has been used to detoxify mycotoxins (toxic by-products produced by fungi and molds). Lipoic acid has also been shown to reverse age-related loss of glutathione synthesis. 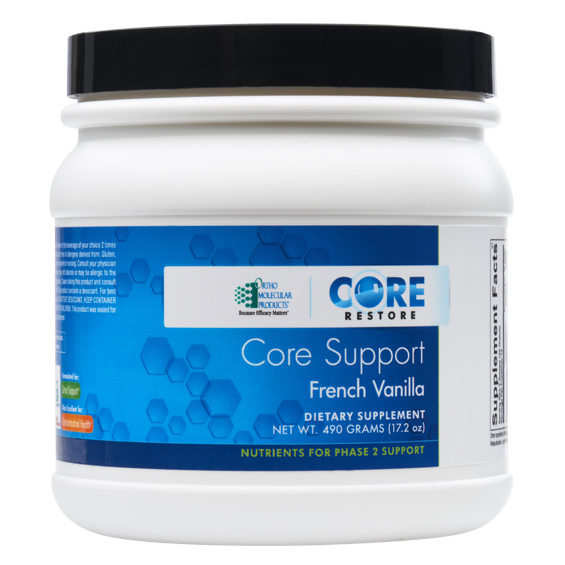 Core Support contains VitaVeggie®, a blend of highconcentration superfood vegetables with significant antioxidant potential. VitaVeggie® is high in ORAC value (oxygen radical absorbance capacity- a method of measuring antioxidant activity) and includes health promoting compounds like sulphoraphane and glucosinolates. Cruciferous vegetables including broccoli, kale, and Brussels sprouts increase the enzyme activity of both Phase I and Phase II detoxification pathways. Sulforaphane induces Phase II detoxification enzymes and supports the body’s response to oxidative stress to promote balanced inflammation. Glucosinolates serve as precursors for biologically active metabolites, which induce Phase II enzymes via the activation of Nrf2, the master cellular switch responsible for antioxidant production. Mix 2 scoops (39.0 grams) of Core Support with 8 oz. of water or the beverage of your choice two times daily, or as recommended by your health care professional. 3. Atkuri KR, Mantovani JJ, Herzenberg LA, et al. N-Acetylcysteine—a safe antidote for cysteine/glutathione deficiency. Curr Opin Pharmacol 2007 Aug;7(4):355-9. Review. 10. Rogers, SA. Lipoic acid as a potential first agent for protection from mycotoxins and treatment of mycotoxicosis. Arch Environ Health 2003; 58(8):528-532. 11. Shay KP, Moreau RF, et al. Alpha-lipoic acid as a dietary supplement: molecular mechanisms and therapeutic potential. Biochem Biophys Acta 2009; 1790(10):1149-1160. 12. Yu R, Jiao JJ, et al. Activation of mitogen-activated protein kinases by green tea polyphenols: potential signaling pathways in the regulation of antioxidantresponsive element-mediated phase II enzyme gene expression. Carcinogenesis 1997; 18(2):451-456. 13. Na HK, Surh YJ. Modulation of Nrf2-mediated antioxidant and detoxifying enzyme induction by the green tea polyphenol EGCG. Food Chem Toxicol 2008; 46(4):1271-1278. 15. Singletary KW. Rosemary extract and carnosol stimulate rat liver glutathione-S-transferase and quinone reductase activities. Cancer Lett 1996; 100(1-2):139-144. 16. Chen CC, Chen HL, et al. Upregulation of NF-E2-related factor-2-dependent glutathione by carnosol provokes a cytoprotective response and enhances cell survival. Acta Pharmacol Sin 2011; 32(1):62-69. 17. Nestle M. Broccoli sprouts as inducers of carcinogendetoxifying enzyme systems: clinical, dietary, and policy implications. Proc Natl Acad Sci U S A 1997; 94(21):11149- 11151. 18. Kim HJ, Barajas B, et al. Nrf2 activation by sulforaphane restores the age-related decrease of T(H)1 immunity: role of dendritic cells. J Allergy Clin Immunol 2008; 121(5):1255- 1261.